Anthony started working in his first pizzeria in New York City in 1976 preparing food in the authentic New York way. Since opening his first location in Orlando in 1987, The Original Anthony’s remains the standard by which the city’s pizzerias are judged. True to his roots, Anthony remains passionate and dedicated about preparing Italian food with the finest meats and cheeses, fresh ingredients, specially prepared dough and homemade sauces. 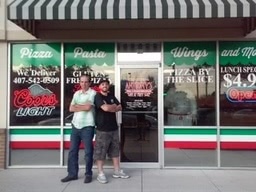 Since opening his first location, Anthony has successfully opened 17 locations. The Original Anthony’s has been voted “Best Pizza” for over 20 years.